The twisting pink mass that looks like frozen yogurt infected with ectoplasm might look disgusting. 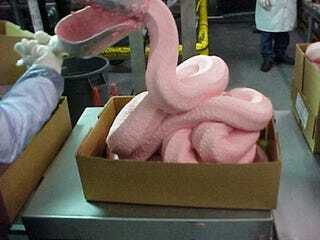 It might be mechanically separated chicken, chicken nuggets in their primordial form. And it is perfectly okay to eat. Because it's crawling with bacteria, it will be washed with ammonia, soaked in it, actually. Then, because it tastes gross, it will be reflavored artificially. Then, because it is weirdly pink, it will be dyed with artificial color. Daniel Fletcher at the University of Connecticut is a food scientist who's been working with poultry for a long time. Genial and approachable, he sounds more folksy farmer than mad scientist, but he knows a lot about the dark arts of meat manipulation: He's famously transformed dark chicken meat into white meat, precisely to be used by the fast food industry. So I asked him to help me unravel where chicken nuggets come really from. Not all chicken nuggets are made from mechanically separated chicken meat. There's actually two general categories of nuggets, Fletcher says. A "whole muscle product" uses a whole piece of meat, which is coated and fried. (Think Chick-Fil-A nuggets.) Then there's a "chop-and-form" product which is more like a hamburger. The latter makes use of "cuts that wouldn't cook well or prepare well in another manner." After you cut up a chicken for the breasts and the legs, there's a lot of perfectly good meat left, so "we trim off the other pieces and make them into other products." To be fair, that's pretty much how you make a hot dog, too. But mechanically separated chicken, while it goes through a process like in this video (ignore the accent, or don't, for fun times) the whole point is pull out what's good, not mash bones into your chicken nuggets. The meat, when it's is chopped up very finely into a paste, is called the "batter." And ground chicken? It's pink. Just shove a piece of raw chicken from the grocery store into a food processor, Fletcher says, and you'll see that the result looks like just like that: a pink paste. Fletcher breaks his calm demeanor just once, when I ask about purifying chicken batter with ammonia to rid it of bacterial infestations, shocked at the suggestion: "You don't mix ammonia with food! That's illegal! And it's stupid. I've never seen anybody pull a stunt like that. These guys invest big money in that product, and would never do that." "It's a highly regulated business," says Flethcher, and one that's "very conscious of its image." More to the point, "they don't put out products that people don't buy." Which, combined with the recent history of food science, explains the rise of chicken goop. One of the major mandates of food science, starting in around the 1970s, when Fletcher first started out, was to "was to extend the food supply by making desirable products out of less desirable material," preparing for a world where protein shortages were common. Instead, food got cheap, and when food is cheap, people are pickier about what they eat. Today, "people want breast meat. They don't want dark meat. Dark meat is a byproduct of the meat now." That's a lot of unloved chicken, that, via the magic of food science, is filling the bellies of tons of gleeful people across the country. Even if the idea of blended, formed and fried chicken grosses you out, it's hard to dismiss Fletcher's moral imperative: "If we're going to kill an animal for food, we're obligated to use the whole thing." The bottom about your chicken nuggets? "If you're going to a reputable place there's not going to be any safety or gag issues." I'll take a double order of barbecue sauce, please.